Salvatore John Campisi was born on August 11, 1942 in Brooklyn, New York. The right handed pitcher attended Most Holy Trinity high school & & Long Island University, Brooklyn Campus. He was signed by the Cardinals in 1964. He won 10 or more games five different times in the minors, going 58-21 with a 2.69 ERA in his minor league career. In 1969 he was 13-2 with a 1.99 ERA, at AAA Tulsa, and got a promotion to the big leagues, going 1-0 in seven games. 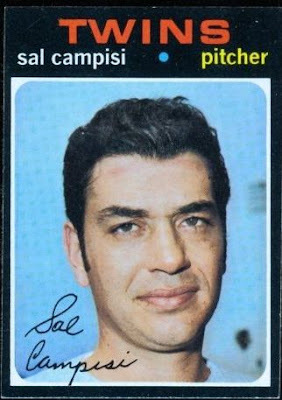 In 1970 he saw action in 37 games, going 2-2 with 4saves posting a solid 2.92 ERA in 49 innings pitched. In October 1970 he was Traded with Jim Kennedy to the Minnesota Twins for Herman Hill & a minor leaguer. He only saw action in six games and was done in the big leagues. His 1971 Topps baseball card is on the high number end giving him a value of around $6. Lifetime he was 3-2 with a 4 saves and a 2.70 ERA.